in for Manual Testing profile, if interested please walk-in for an interview on 26th to 28th Nov. ’18 if you meet the eligibility criteria. > Interact with project management and development teams to develop a strong understanding of the project and testing objectives. Involved in approach definition, requirements elicitation & refinement process to baseline the checklist required for the final deliverable. Should be able to prepare test scripts (or) customize client driven test scripts based on the requirement need. Support production deployment of applications and perform validation testing on need basis. Analytic tool experience is an added advantage (e.g) Fiddler, Metatag etc. Immediately Wanted Software Testing Trainers 2 NOS. > We are looking for Software Testing trainers for reputed 7 years old IT Training Center. > Must have real time working experience. > Your responsibility will be providing real time scenario training to our students. > You will be providing training as per students availability. SOFTWARE DEVELOPMENT ENGINEER TEST I/II @SWIGGY!! > Must have prior experience in creating test automation frameworks and self-serve tools. > Hands-on automation experience required in Selenium & Appium for UI. > Must have prior automation experience for Rest based webservices using Java (testng,maven, httpclient, Rest Assurred, JAXB, JAXRS, Jersey, Jackson, Jmeter). > Must have strong hands-on experience on functional and non-functional automation both for Web, Rest services. > Must be strong in writing complex SQL queries using joins. > Must have hands on experience on designing database schemas for self-serve utilities. Few words about Unify Technologies: Unify is a pioneer in developing technology solutions towards imparting greater value and creating collaboration amongst global businesses. Unify leads the way in changing the conventional wisdom to assure greater returns on investments made. Unify helps customers focus on their business while taking care of your software needs with a global strategy to transform their company. > 7-11 years of experience in software testing and test automation/performance, with solid, demonstrable understanding of software development and testing practices. > Experience in Functional/ Integration testing on hardware using testing tools. Contact Company: KPIT Technologies Ltd.
> Looking for the candidates from product base companies. > Solid understanding of the operating system software, as well as knowledge of object oriented design principles. The Quality Assurance Tester creates and executes test plans for Enterprise Data Management (EDM) projects ensuring solutions work as expected and meet a high standard of reliability. This position creates and manages well-defined, plans and executes test plan to identify any potential issues through a combination of manual and automated means. Understands client business requirements and test cases prepared by Lead and can execute those test plans effectively. > Participating in design and code inspections. > As a member of the software engineering division, you will assist in defining and developing software for tasks associated with the developing, debugging or designing of software applications\ Provide technical leadership to other software developers. Specify, design and implement changes to existing software architecture to meet testing requirements. 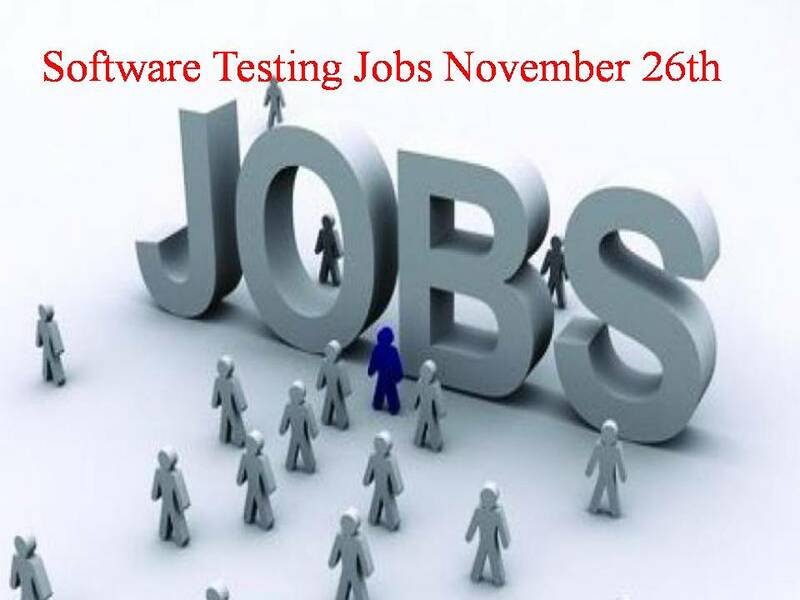 Company Name : Sriv Testing Consultants Hub Pvt Ltd.
> 5+ years of Experience required as a QA Analyst. > He/she should be well versed in Oracle EBS with sound knowledge in OTC modules (AR,OM,GL). > V. Experience working in an Agile/Scrum development process is a plus. You will be a part of a high velocity development team who are working independently to deliver tools for a new, exciting developer focused offering from HERE. You will iterate on code and concepts quickly to build out and enhance the user and developer experience. This is a unique opportunity as the project itself and supporting tools will be made Open Source at launch, bringing also the chance to collaborate with the OSS community. > Important note: Please consider the years of experience as a mandate before applying. Would be rejecting any candidate who doesn’t fit into the mentioned years bracket. Would consider + or – 0.6 years not more than that. > Generate safety requirements for testing from the functional requirements.